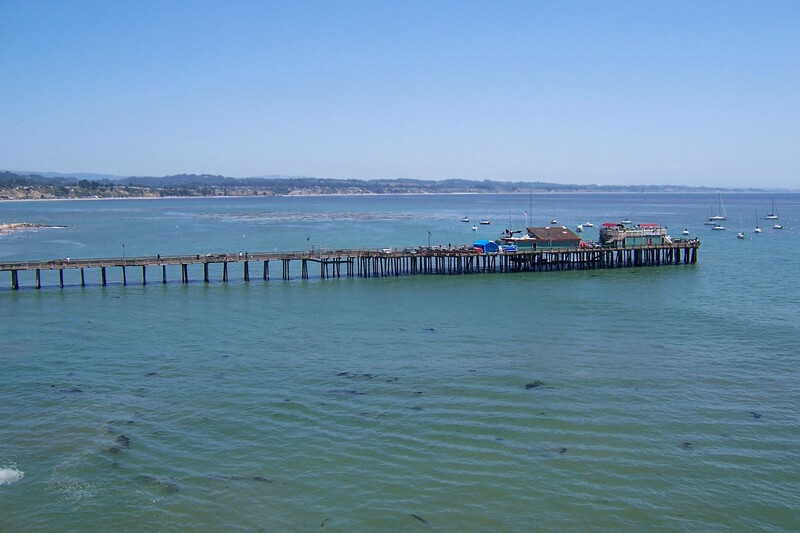 While some piers along the coast (such as Seacliff) have characteristics that help define and give identity to the pier, here it is the area itself that makes the pier special. 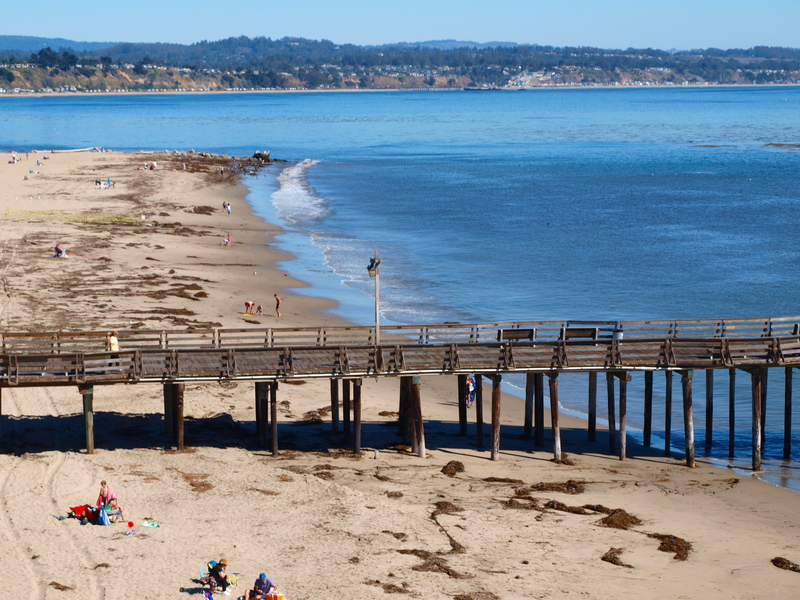 Supposedly the oldest seaside resort along the Pacific coast, Capitola has, since 1869, been a destination for inlanders headed to the coast. The area today is one of restaurants, stylish tourist shops and art galleries. 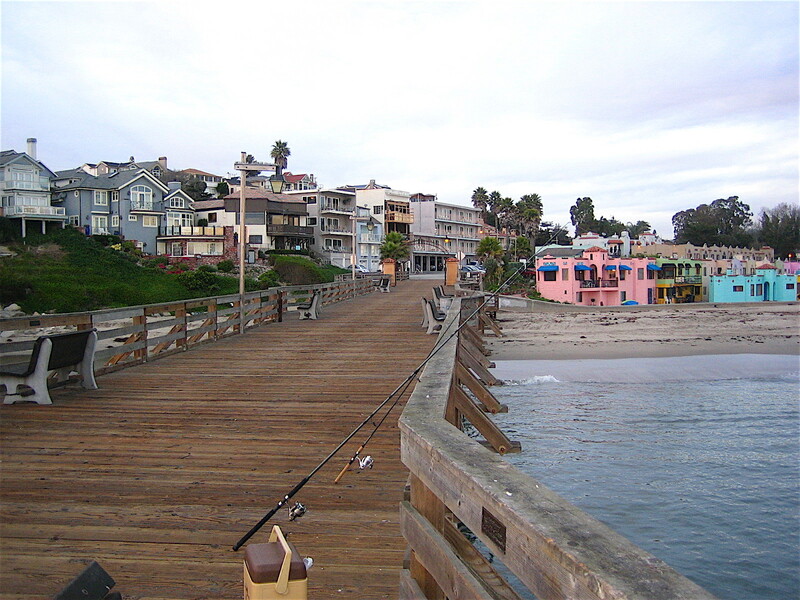 The main area near the beach is really only a few square blocks, but it is made up of commercial buildings, old Victorian houses, a restored railroad depot and, at the front of the pier, a 1920s condominium-type area known as the Venetian Court, complete with pastel colors and ornate architecture. 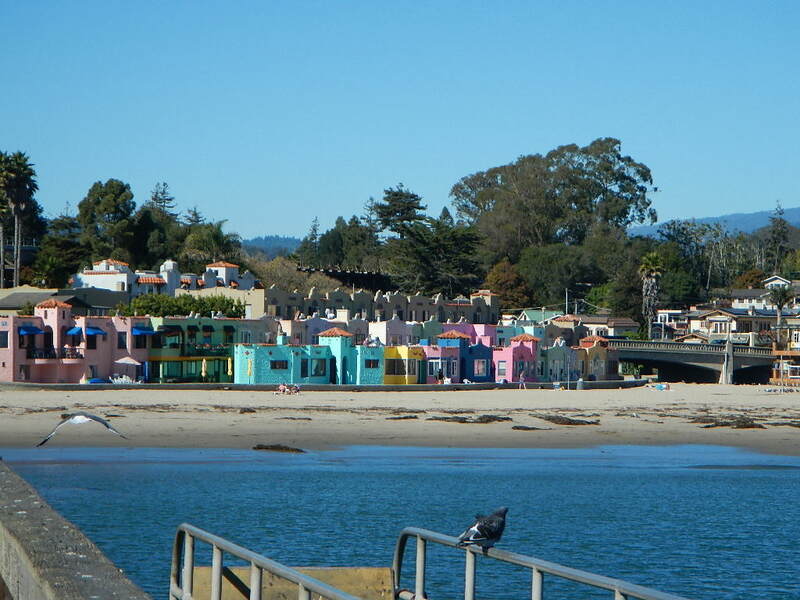 People in Capitola seem to regard their “village” as an up class, perhaps more dignified, version of a beach town, in contrast to Santa Cruz and its weekend hordes. Environment. 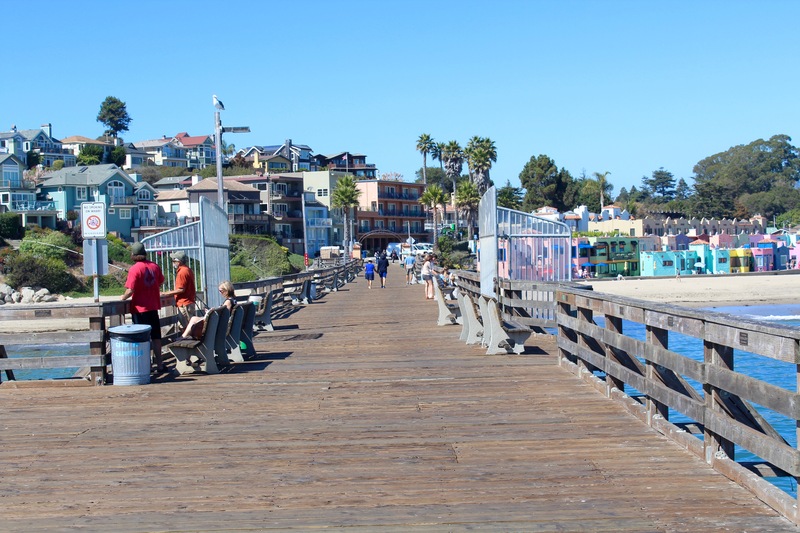 The pier itself is relatively new, having been rebuilt in the mid-1980s following storm damage which nearly destroyed the old pier. 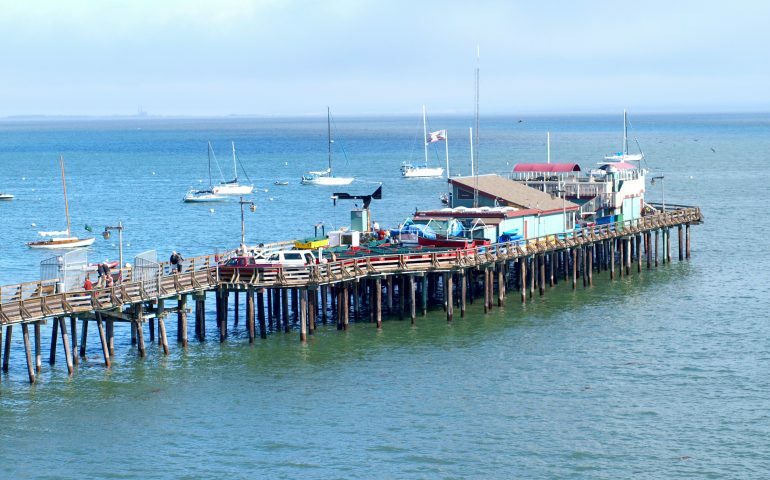 Luckily, the new pier is wood (which I always prefer) and although the pier is only 855-foot-long, it is rarely crowded with pier anglers unless there is a “run” of fish present. At such times, railing space can be at a premium. 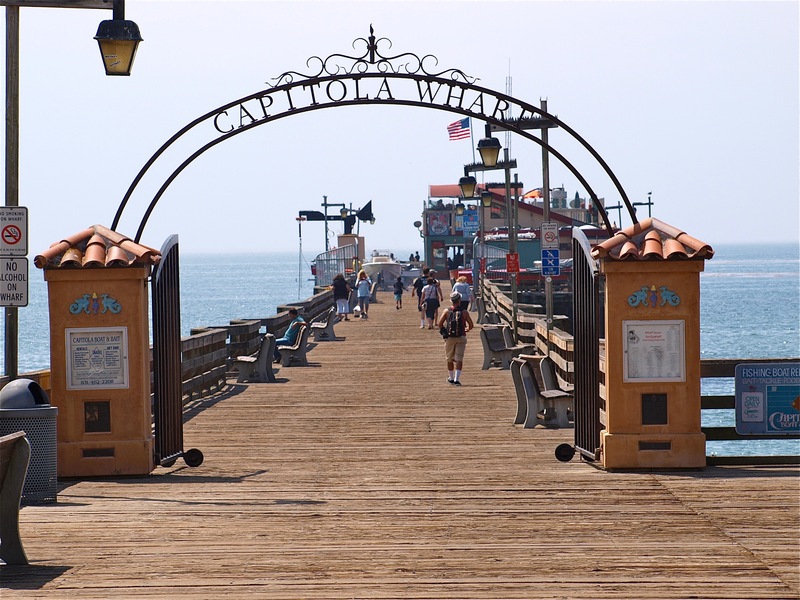 The majority of people on the wharf are visitors out for a stroll or people heading out to the restaurant. Even the majority of fishermen here are, and I’m guessing, boat anglers heading out to fish the nearby reefs. Some come to launch their own boats, some come to rent the boats that are available on the pier. 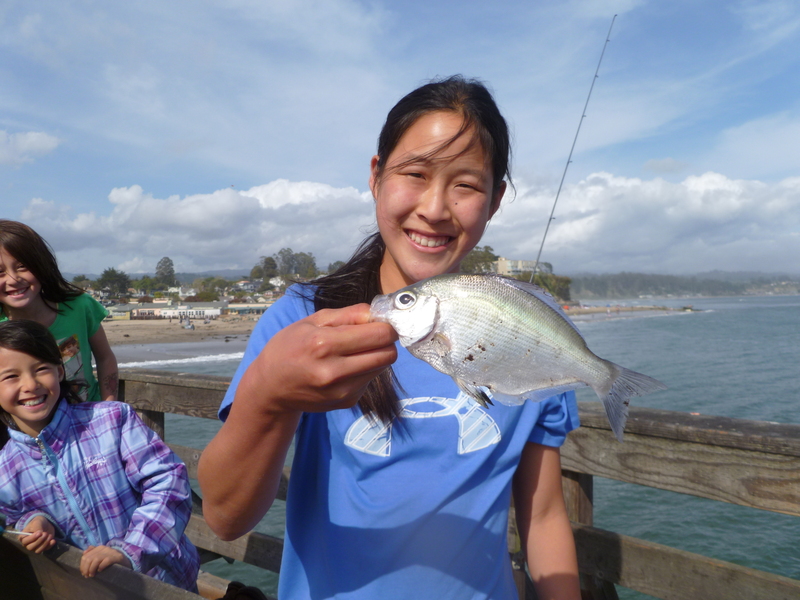 Excellent fishing is found fairly close to the pier for several species. 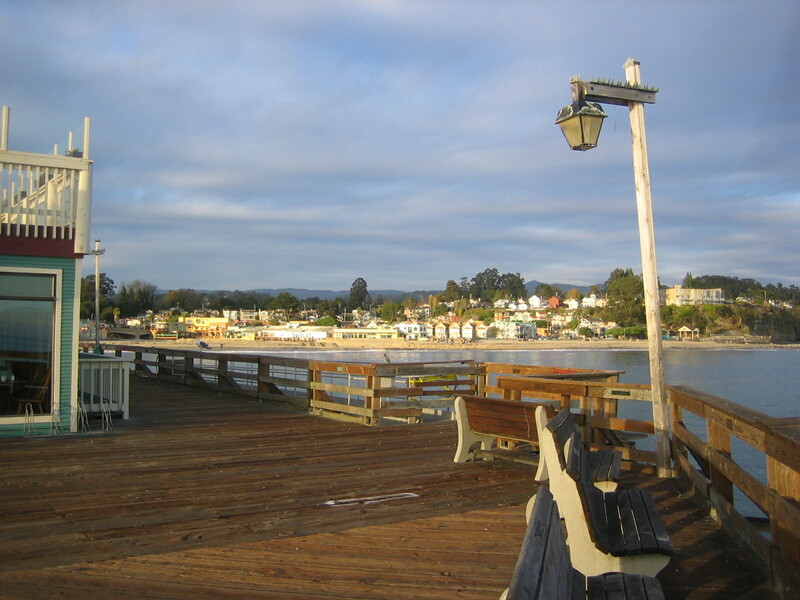 The shore end of the pier fronts two beaches, Hooper Beach on the north side of the wharf, and Capitola City Beach to the south. Inshore, it’s a typical sandy beach environment with surfperch predominate in the catch. Spring to fall can see striped bass in these inshore waters, especially if the anchovies surround the pier, but it doesn’t happen every year. 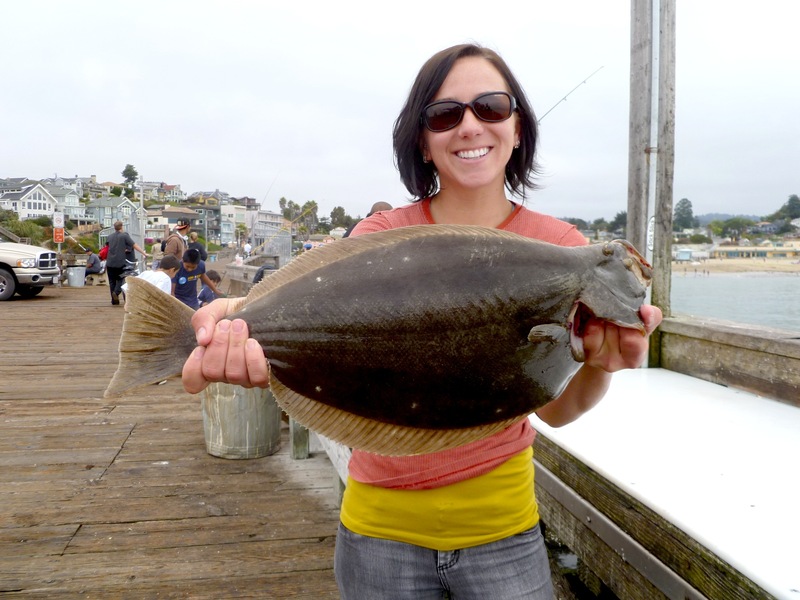 The inshore area extending out to mid-pier will see halibut (spring to fall) and other smaller flatfish much of the year. Further out on the pier sees a bottom that is a mixture of sand and mud. Pilings have a fair buildup of mussels and there is often a fairly thick buildup of kelp around the pier from the midsummer months to the fall. 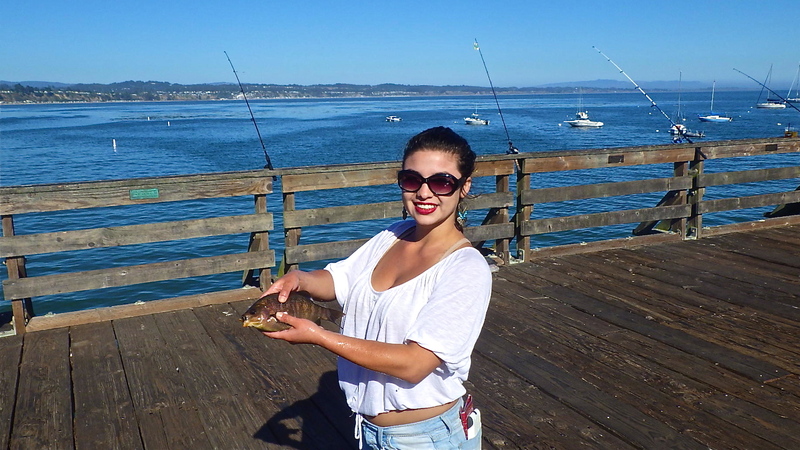 Fish are attracted to the mussel-encrusted pilings under the pier and the kelp covering that can provide protection. 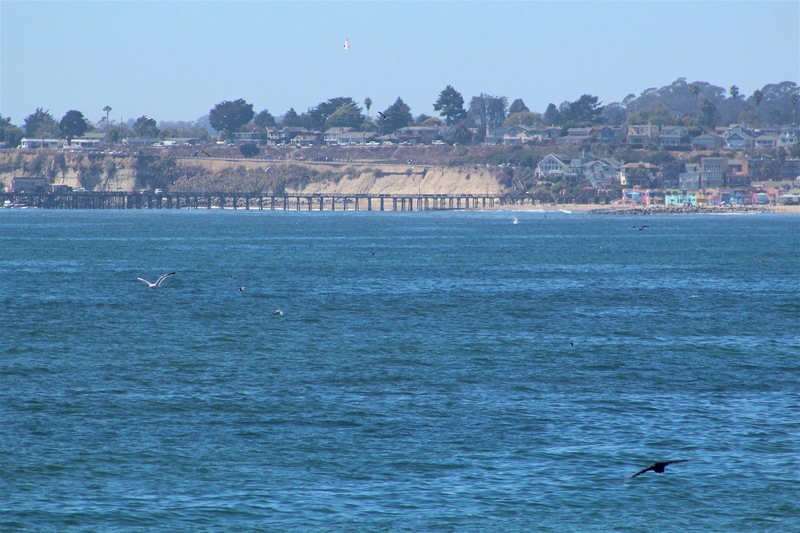 In addition, Soquel Creek runs into the ocean just down the beach from the pier. During the winter, the mouth of the creek stays open, during the summer, it usually closes and a small lagoon, mostly used for swimming, forms just inside the city beach. Because of the creek, most years will see some steelhead caught during the fall and winter months as they wait for the mouth of the river to open. What all of this means is that an angler is presented several different areas and environments to fish and each can yield different varieties of fish. At the same time, each environment can call for a different approach on the part of the angler. Rarely seen fish that have been caught in these waters include barracuda, triggerfish, black sea bass (see below) and sturgeon; but your chances of landing one of these are about the same as hitting a Lotto Jackpot. Occasionally though an unusual fish is landed from the pier; one such fish was an American shad that was caught on a Sabiki rig in July 2009. Fish and Fishing Tips. 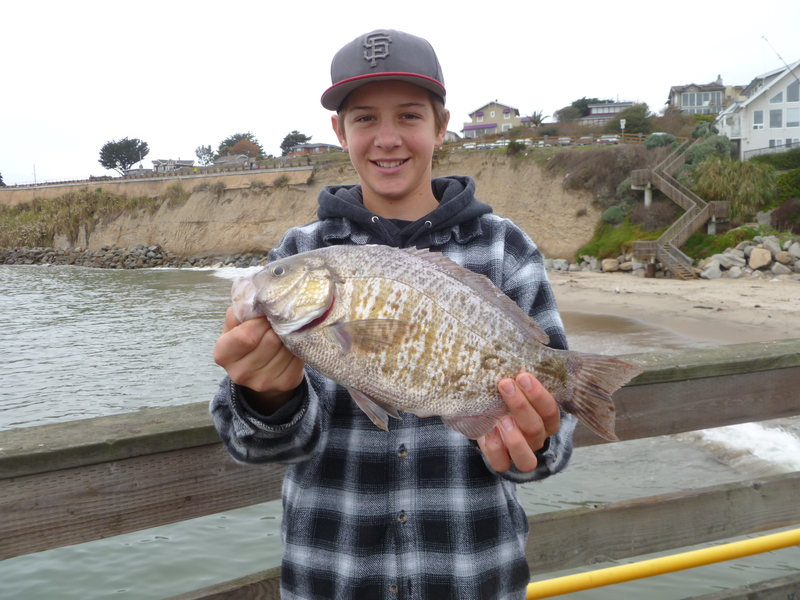 Anglers tend to target four areas for effort—the inshore surf area for surfperch, the area just past the breakers for stripers and halibut, under the pier for perch and other kelp/rock species, and the waters out from the end for a variety of species. One of the most reliable areas is the surf area, especially on an incoming tide. 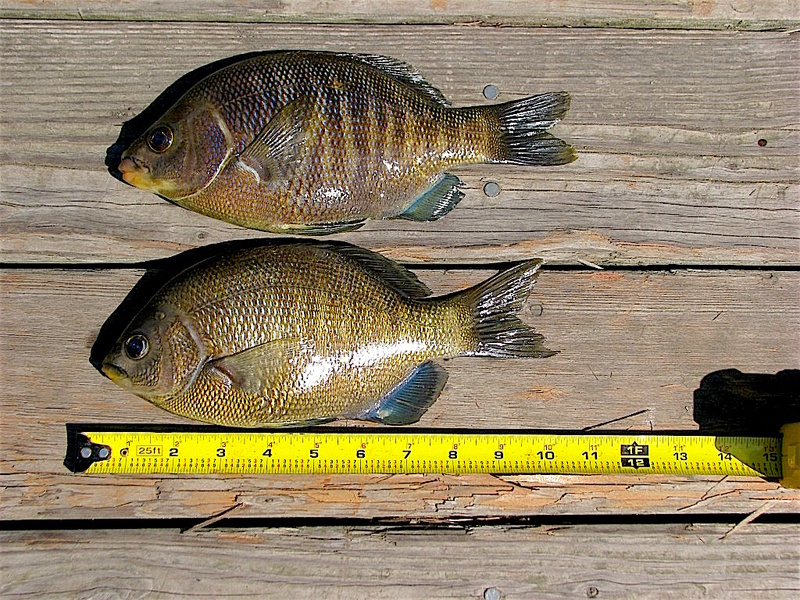 The result is the larger barred surfperch (reported to three-pounds) and calico surfperch. For these, use sand crabs, pile worms, fresh mussels or small pieces of market shrimp. If you like artificials, try a 1-1/2 to 3-inch plastic grub with root beer, motor oil/red flake, and pumpkin seed patterns often producing the most fish. Two-inch Berkley Gulp! Sand Worms and Minnow Grubs (in pumpkinseed color) can also be productive. By far, the winter and spring months are the best for these perch but some will be caught throughout the year. According to Ed Burrell who has worked at the pier’s bait shop, and is “the expert” as far as I’m concerned, “the best perch conditions occur when the water is clear and the wind creates a nice chop on the ocean surface.” Thus in the wintertime the runoff from the nearby Soquel Creek can affect the fishing for the perch, especially if the runoff muddies the water. When it starts to flow south, away from the pier, the bite picks up. 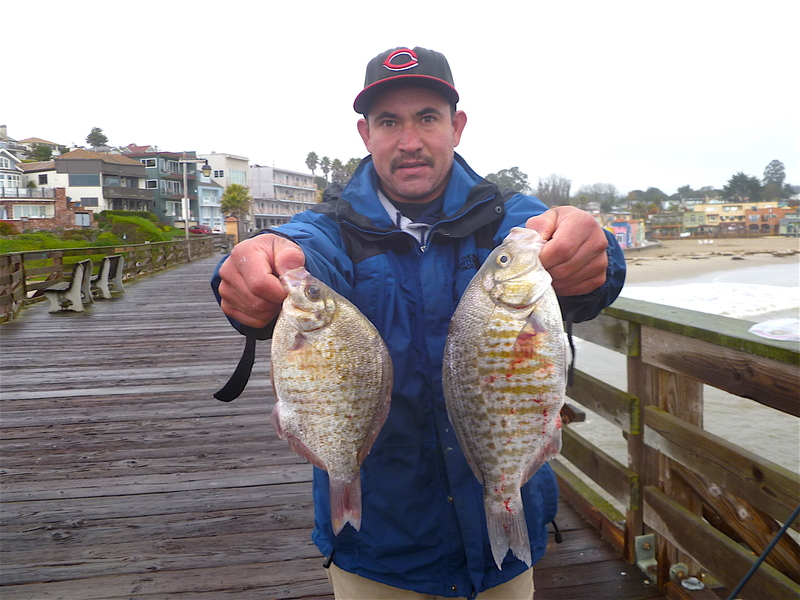 Outside the surf area to about mid-pier seems to be the best area for both California halibut and striped bass. 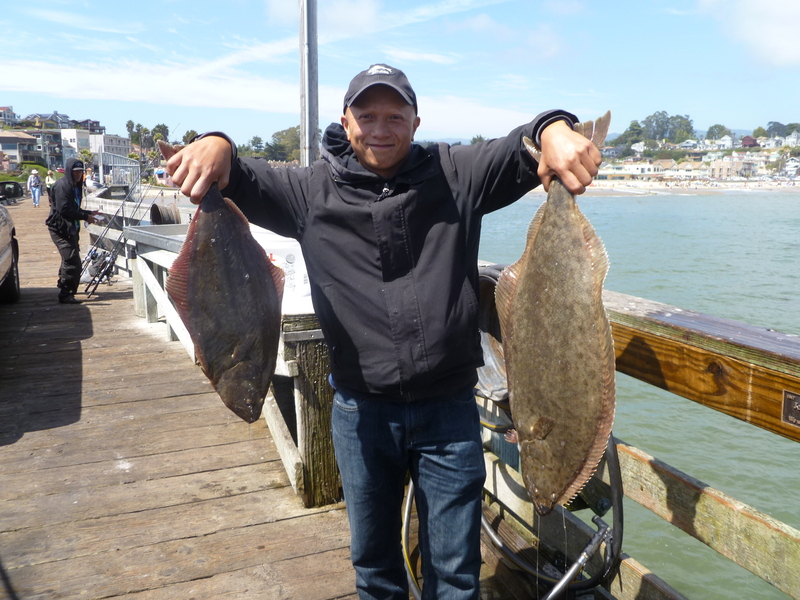 May through July is usually the prime time for the flatties and most years will see some fairly impressive sized flatfish landed (20+pound size). Most will be caught on live bait such as anchovies, shinerperch, small kingfish, sardines, or small mackerel (some years), and all should be fished on the bottom with live bait rigging (although in the shallows you can also fish them under a float). If you’re not into using bait, a few flatties will also be taken each year on artificials such as Hair Raisers, Big Hammers and Scampis. Smaller flatfish—sand sole, starry flounder, Pacific sanddab and diamond turbot—are sometimes also seen in these areas with pile worms fished on a Carolina rig or high/low rigging seeming to produce the most fish. The starries and sanddabs are generally seen winter and spring while sand sole (to four pounds) and the occasional turbot may show up any month. Similar riggings may also attract a striped bass but they are less particular and will often hit a piece of mackerel or sardine, shrimp, or a pile worm that is graciously offering up its life so that our noble anglers can experience the thrill of a striper. Most of the stripers range from 8-15 pounds but bigger ones are caught (including a 31-pound fish in September of 1995. November of 1997 proved especially interesting when a school of about 70 stripers came into the shallow water by the pier and teased the anglers on the pier; only a couple were caught. 2004 saw a huge run of fish that lasted for several weeks. 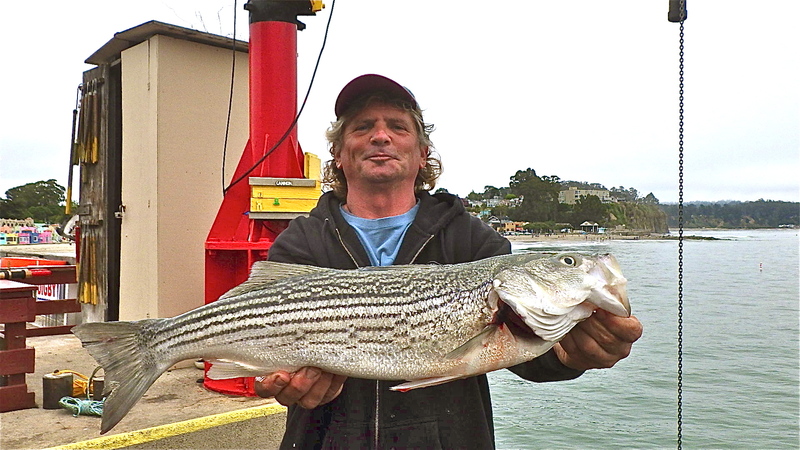 Keeper fish were caught daily with a 27-pound fish apparently leading the way (although a 28-pound striper was caught on a Pencil Popper adjacent to the wharf). Ditto 2005 when the stripers pushed anchovies up against the beach and feasted on the bait. Anglers used bait rigs to catch anchovies and then fished them under bobbers for the stripers. In fact, stripers have shown up every summer since 2004 and every year has seen 20+pound fish landed, and some that approached 30 pounds. The summer of 2009 saw stripers become regular visitors to the pier. 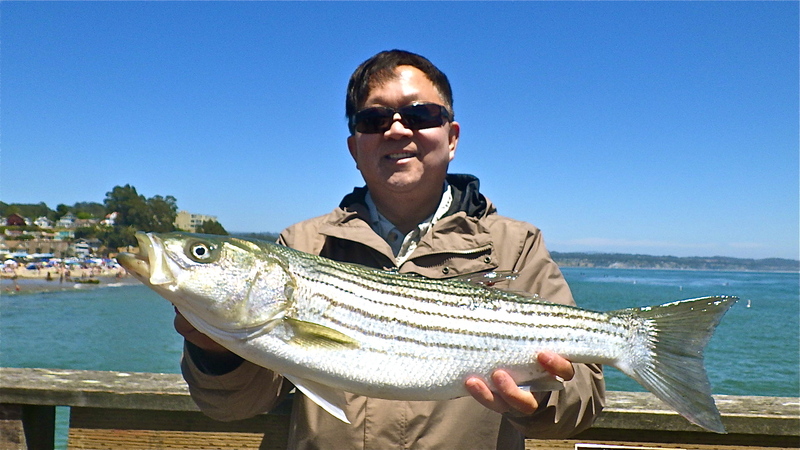 Regulars on the pier used bait rigs to catch live sardines that were used for bait; the result was daily landing of stripers topped by a 29-pound fish in late July. 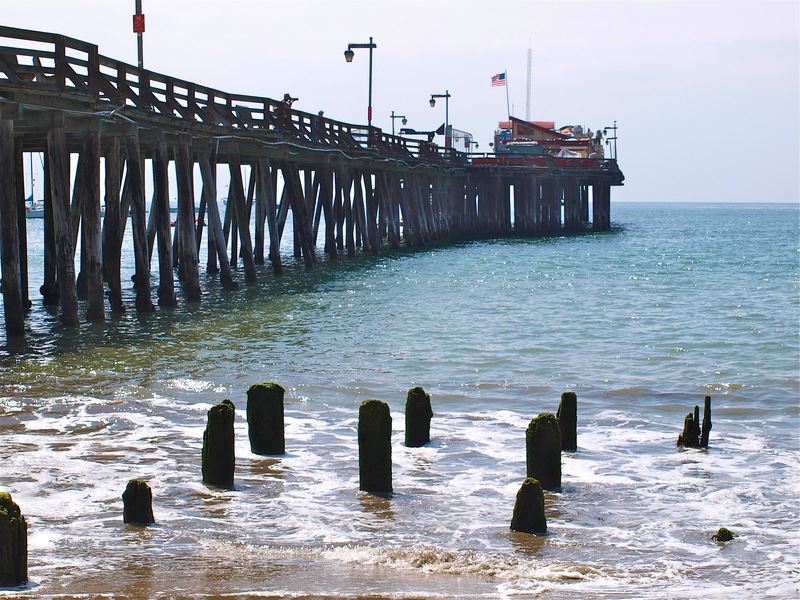 Fishing under the pier, by the pilings, is a time honored pier tradition and here it is usually practiced from the mid-pier area to the end. Many anglers like to use a bait rig— Sabiki or Lucky Lura—although I prefer simple high/low riggings with a size 6 hook and a one-ounce torpedo sinker. Small pieces of anchovy fished mid-depth to the bottom, will often yield walleye and silver surfperch, sometimes in non-stop fashion, but generally do not attract the other seaperch. Pile worms, small strips of fresh mussels, or small pieces of market shrimp, fished down around the pilings at the end, will often attract blackperch (aka buttermouth) as well as pileperch, white seaperch (aka splittail perch), rainbow seaperch, and an occasional rubberlip seaperch (reported to three-pounds). Although winter and spring seem the best times, you may catch a large seaperch at almost any time of the year. If bait isn’t producing, try lures—plastic grubs or small spoons—and simply jig them up and down in the water near the bottom. Root beer or oil colored grubs can be deadly as can small 1/12 or 1/8 oz. chrome, chrome with blue, or chrome with green Kastmaster spoons.